The Liberal Democrats' plans contain a number of progressive priorities. But their tax plans are regressive and the funding is "highly speculative", say the IFS. 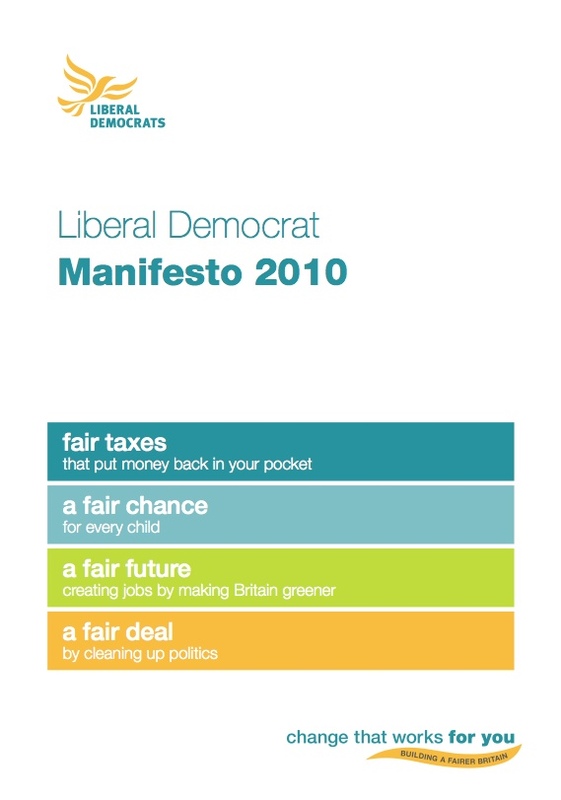 The Liberal Democrats have today released their manifesto, ‘Change that works for you’. As with the Labour and Conservative documents earlier this week, we assess their document against our readers’ favourite manifesto ideas and examine some of the other progressive areas. • Make only one mention of the living wage, in the context of a section on a ‘sustainable farming industry’. But the Liberal Democrats have been the boldest party in pledging to “Rule out the like-for-like replacement of the Trident nuclear weapons system.” As Left Foot Forward outlined last week, Nick Clegg has suggested replacing Trident with Astute. We have previously examined their other key pledges. An earlier version of this story suggested that the Lib Dem’s had not mentioned a Robin Hood Tax. They hadn’t but had pledged to introduce a ‘Financial Transaction Tax’ which we had missed. Apologies for that. This is something that I’m curious about. Are benefits worked out on gross or net income because if it’s gross then the Lib Dems pledge to raise the threshold would make no difference. the Lib Dems have underestimated the amount of money they could raise from their other tax measures. Finally, when you talk about the second richest decile receiving more in terms of a benefit than the lowest, have you factored in what they would lose in terms of the reduction in higher rate tax relief as well as the rise in capital gains? Will I am a little confused by saying no mention of ‘Robin Hood tax’ on page 62 it very clearly talks about introducing a financial transaction tax – which by any other name is a Robin Hood Tax is it not? also on page 42 in manage water for everyone may not bring water back into public ownership but will introduce smart meters for water and on top of the social tariff that Lib Dems got introduced into the recent floods and water bill (opposed by the tories) makes water pricing more equitable and fairer. I think it’s worth mentioning that the Liberal Democrats also pledged to reduce train fares and are the most committed to electoral reform of the three main parties. I actually thought it was a pretty good manifesto, certainly more gutsy than the other two. Given that this technically isn’t a Labour blog (regardless of Will Straw’s personal affiliation) but one for progressives, it would have been nice to see some of the many good points discussed a bit further. Bill, benefits are worked out on your income before tax rather than after, so this wouldn’t affect those on income-related support like Housing Benefit. There are certainly some interesting ideas in there. I am particularly interested in hints they have given before on reprioritising transport spending away from road widening and runway 3 on to rails. Though I do still believe the railways should be renationalized. I do not agree with their opposition to ID cards; the reason why I support them is that they cannot just be used to fight crime; they can be used I believe by consumers as a form of ID for goods and services. And I think we have to have the biometric pastports under European rules anyway? On tax, I think that clamping down on tax avoidence and increasing aviation duties are a good idea, however, I am not sure how much better off people would be by the changes to income tax when 1 considers the cuts to things like Child Trust Funds. And I have always stated my opposition to changing the voting system and an elected Second Chamber, but that’s no reason to shut out the debate as the Tories want to do. So, overall, I don’t agree with everything, but of the 2 opposition parties the Lib Dem manifesto is certainly more sensible than the Tory one. Why are you socialists such sanctimonious, self righteous nincompoops? You have this black and white view of the world in which you alone are right and those who oppose are completely wrong, deranged, bigoted, backward-looking, swivel-eyed lunatics? Obama dismisses his unpopularity by saying he hasn’t explained his vision well! It might be due to the fact that twice as many Americans identify themselves as conservatives than liberals, and that America is a conservative country. All of this self proclaimed ‘progressive’ nonsense is vapid, fatuous and vacuous. The problem with socialism is that it assumes that ‘fairness’ is an objective concept and nobody dissents from what ‘fairness’ ensues. This is absurd nonsense, even more absurd than the Rational Expectations and Efficient Markets balderdash espoused by Chicago School economists (thoroughly rejected by my Austrian school friends of course!). To socialists, an 83% tax rate on the rich is ‘fair.’ To be, it smacks of envy, spite, bitterness and ‘unfairness.’ As Hayek brilliantly explained in his classic polemic, ”The Road to Serfdom,” socialists assume an objective definition of fairness, and therefore they will know the outcome of ‘fair and progressive’ policies, because otherwise, they woulnd’t be ‘fair and progressive.’ However, if the government already knows the outcome, it leaves no choice to the individual citizen. Those who dissent from the Guardian reading orthodoxy are not granted their democratic right to freedom of choice and expression. So please drop all of this angelic, self righteous nonsense please Mr Straw. You are not progressive, as you wish to take Britain back in time to the attempted creation of a socialist utopia by Atlee and his successors, who failed miserably, creating the welfare state aristocracy of today. Beveridge would be ashamed at how the Labour Party has abused his creation for narrow political ends. As Jonah Goldberg eloquently exposed in ‘Liberal Fascism,’ the intellectual root of modern liberalism (not the Gladstonian liberalism I align myself with) and progressivism is fascism. Fascists and lefties both believe in nationalisation, dirigisme, a large state, a heavily taxed private sector and punitive taxes on the rich. The early fascists were men of the Left. Hitler was a National Socialist. Mussolini ‘Il Duce’ was the leader of the Italian socialists. Fascism is not a far right ideology, but a thoroughly left wing one. Because of the violence associated with it, you disassociated yourselves from it and called it a right wing ideology. Right wing ideology believes in a small state, individual freedom, libertarian economics and some of us believe in libertarian social views also. All of you lefties have to accept your intellectual heritage, including Fabian eugenics and your support for Soviet Communism despite its horrific despotism and mass murdering leadership. You are not progressives… you are fascists with smiling faces. Josh: Absolutely brilliant. Are you on twitter? I’d like to follow you. I’m going to email your post to everyone I know. “You are not progressives… you are fascists with smiling faces.” You should print that on a t-shirt and make some good old capitalist money! Thanks for that, so it seems Gary Gibbons at C4 was wrong, people wouldn’t lose out on any benefits if the threshold was raised to £10k. Finally, I’ve no idea what you mean by “welfare state aristocracy” but can only presume that your preferred route ahead would involve scrapping the NHS as other Austrian school advocates like Daniel Hannan would propose. Good luck on that one – if you think the British public share your views, you’re as deluded as the fascists of the 20th century. Why oh why did the Lib Dems have to oppose nuclear power? Will- Ah… apologies, I’ll read the links next time. Josh- Does the phrase “sweeping generalisation” mean anything to you? If you bothered to read up on modern socialist thought, you’d see that there is a wide range of opinion. You’ll also see that there is a near universal emphasis on using evidence to back up arguments, which is more than can be said for the Austrian School of Economics. Josh, all I can say is, what on Earth? Anyway, back on the manifesto, I cannot believe the Lib Dems want to drop both Control Orders and 28 day detention for terrorist suspects. For, Terrorist plots are getting more serfisticated and complicated, and the police officers have clearly said they need more time to investigate. I think the current arangements are just fine, and to scrap them would make our task harder. BTW Will, are you going to cover the Green Party’s manifesto?